The Christmas celebrations are in full force at Rizk casino, where you have not only one, but two Christmas calendars to look forward to every day this month! Play the best games from the games provider Yggdrasil, and pick your gifts to win up to £100 cash daily. The casino games maker Yggdrasil have some of the most popular and unique slots you’ll find at most online casinos. And now you have a great opportunity to play beloved Yggdrasil slots such as Vikings Go Berzerk, Jungle Books and many more by participating in their December slots tournaments and missions. Play the right Yggdrasil game at the right time to get a chance of scoring a superb cash prize all month. €500,000 will be handed out to players in total, ending with a €80,000 mission at the end of the month! Visit the promotion page at Rizk to see the full calendar schedule. Don’t forget about the other Christmas promotion currently happening at Rizk - the Rizkmas calendar! Every day you will be presented with three gifts when you log into your player account. Pick one of them to reveal its secret gift, that can be anything from turbo chips and bonus spins - up to £100 in straight, withdrawable cash. Captain Rizk has spent a long time preparing this Christmas calendar, so practice your picking skills and hope to get one of his best gifts. Read everything about the Rizkmas promotion and the bonus terms and conditions on the promotion page at Rizk. Kick-start the Rizkmas celebrations with a fabulous welcome bonus in the casino. 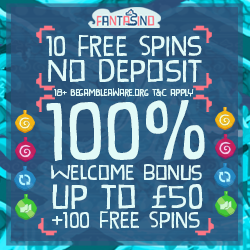 Create your player account in just a couple of minutes and get 100% bonus up to £100 and 50 bonus spins when you make your first deposit. But that’s not all, as you play at Rizk you will increase your account level and earn spins on the Wheel of Rizk. Spin the wheel to win wagering free bonus spins, cash prizes and much more. Get spoiled with rewards and frequent casino promotions that will boost your casino entertainment, and play your favourite slots from many games providers. Note that the deposit and the bonus money will be combined to one balance with a wagering requirement of x20, but the welcome extra spins are wagering free. For full bonus terms and conditions, visit the bonus page at Rizk.